The Municipal Market of Rubi wanted to update its corporate image, taking advantage of the comprehensive renovation taking place in its building after more than half a century in operation. The first and most significant work done was on the mainfaçade and on improving access to a new open square. This main part of the market is now wrapped in a unique wave-shaped metallic mesh, which attracts attention and gives it a distinctive new identity. For the design of the new corporate identity we kept all of this in mind and were inspired by the diamond-shape used in the wrapped mesh of the façade, using that as a base for designing the M of the market’s logo. 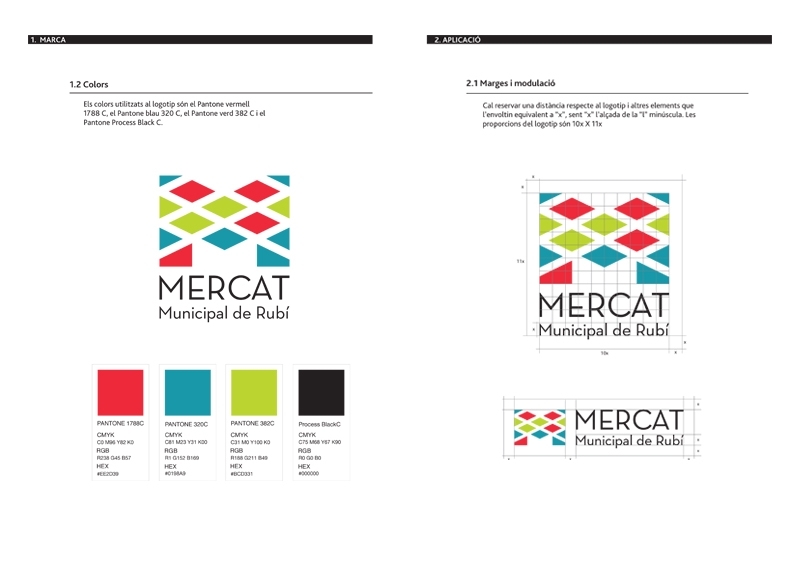 Additionally, to compensate the symmetry and seriousness of the logo, we selected a palette of three colours and used them randomly, in keeping with the seemingly unplanned distribution of the market stalls. The colours, in fact, represent the three principal fresh product groups which can be found in the market: meat, fish and fruit & veg. Use of the corporate image at the entrance.